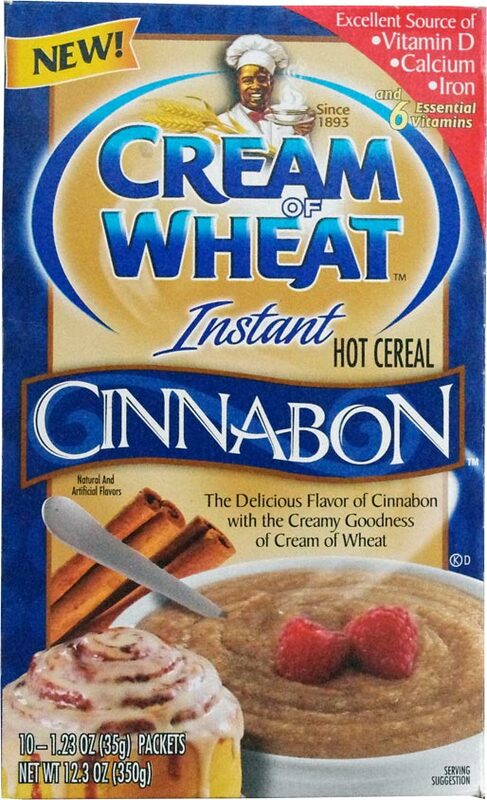 The complete name of this product is Cinnabon Cream Of Wheat Instant Hot Cereal. It's good stuff, but don't expect to be blown away. If you buy this product because of the Cinnabon logo and the picture of the cinnamon roll dripping with icing, you could be in for a let-down. Mind you, the cinnamon flavor is great. It's bold and hits you over the head a little more than the average hot cereal with "cinnamon" in its name. But beyond that, there's nothing particularly new or interesting about the flavor. If you take regular Cream Of Wheat and stir in the right combination of cinnamon and sugar, you can reproduce the same flavor you'll find here. Speaking of sugar... buyer beware. Hot cereals aren't always the best breakfast option. If your eye is on sugar... Cinnabon Cream Of Wheat has 14 grams of sugar per serving. That's actually 3 more grams than Lucky Charms. I half-heartedly recommend this product. If the somewhat-misleading packaging gets people to try hot cereal for the first time, that's a good thing. The flavor is more than satisfactory. If you're a person that likes hot cereals for fiber and lower sugar, you should really see what else is in the store. The package instructs you to use 1/2 cup water or milk per packet of hot cereal. I'd recommend using between a 1/3 and 1/2 cup of liquid. The cereal was too soupy at a full 1/2 cup. I'd also strongly suggest covering any cup or bowl you place in the microwave with a paper towel. At the 1 minute and 15 second mark, the Cream of Wheat starts to act volcanic.... spewing and spouting hot cereal all over your microwave. 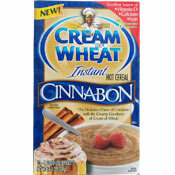 What do you think of Cinnabon Cream Of Wheat? This flavor is the worst I ever had. I took two bites and threw it in the trash. This is what my mom made for me when I was a child, including a little butter. I miss finding it in the stores. Excellent cinnamon and sugar flavor! It is my son's favorite cereal. Unfortunately, no one in our area carries it any more, so I appreciate the suggestion to make you own with Original flavor! Thanks! Sometimes the stores run out of this flavor. May have to wait for weeks to replenish. Really enjoyed this flavor, though I am hoping to recreate it with plain Cream of Wheat & cinnamon sugar. Just hoping to save a few pennies that way! I'm seeing a little too much 'Cinnabon' advertised on a multitude of products and I think they're getting out of hand. I wasn't surprised by the review. I was thinking the same thing. You don't need the 'Cinnabon' label to get this flavor. Really tastes like the sweet treat that would leave you feeling guilty.